The transcription factor IFN regulatory factor (IRF)5 has been identified as a human systemic lupus erythematosus (SLE) susceptibility gene by numerous joint linkage and genome-wide association studies. Although IRF5 expression is significantly elevated in primary blood cells of SLE patients, it is not yet known how IRF5 contributes to SLE pathogenesis. Recent data from mouse models of lupus indicate a critical role for IRF5 in the production of pathogenic autoantibodies and the expression of Th2 cytokines and type I IFN. In the present study, we examined the mechanisms by which loss of Irf5 protects mice from pristane-induced lupus at early time points of disease development. We demonstrate that Irf5 is required for Ly6Chi monocyte trafficking to the peritoneal cavity, which is thought to be one of the initial key events leading to lupus pathogenesis in this model. Chemotaxis assays using peritoneal lavage from pristane-injected Irf5+/+ and Irf5−/− littermates support an intrinsic defect in Irf5−/− monocytes. 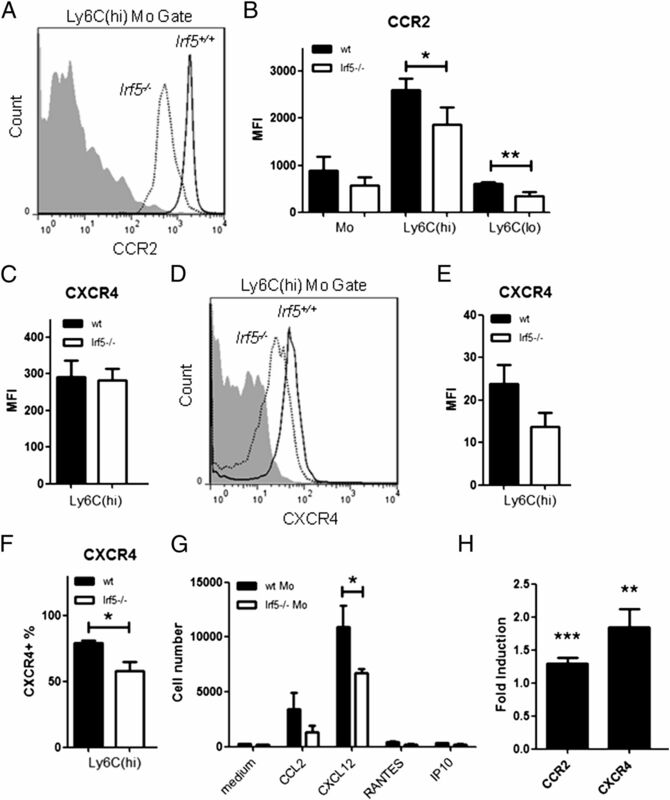 We found the expression of chemokine receptors CXCR4 and CCR2 to be dysregulated on Irf5−/− monocytes and less responsive to their respective ligands, CXCL12 and CCL2. Bone marrow reconstitution experiments further supported an intrinsic defect in Irf5−/− monocytes because Irf5+/+ monocytes were preferentially recruited to the peritoneal cavity in response to pristane. Taken together, these findings demonstrate an intrinsic role for IRF5 in the response of monocytes to pristane and their recruitment to the primary site of inflammation that is thought to trigger lupus onset in this experimental model of SLE. Systemic lupus erythematosus (SLE) is a complex autoimmune disorder characterized by multiple immunologic abnormalities that lead to a break in self-tolerance and the production of autoantibodies (1, 2). Patients display elevated type I IFN in their serum and IFN gene signatures in their blood cells that correlate with disease activity and severity (3). At this point, nearly all key elements of the immune system have been implicated in the pathogenesis of SLE (1). Monocytes/macrophages have been increasingly recognized to play a dynamic role in the initiation and perpetuation of SLE given their hallmark functions in phagocytosis, Ag presentation, and cytokine production (4). Increased influx of monocytes to sites of inflammation and aberrant expression of cytokines and surface activation markers on monocytes have been documented in SLE patients (4, 5). Recent studies in the pristane (or 2,6,10,14-tetramethylpentadecane)-induced model of murine lupus revealed that monocytes play a key pathogenic role by acting as a major producer of type I IFNs (6, 7). The transcription factor IFN regulatory factor (IRF)5 has been identified as an SLE susceptibility gene in numerous large-scale genetic association studies (8–13). IRF5 controls multiple inflammatory and immune responses through its regulation of type I IFN expression and IFN-stimulated genes (14–17). IRF5 is also a key mediator of MyD88-dependent TLR signaling, and is thus a critical factor controlling the expression of proinflammatory cytokines (18). We have recently demonstrated that mice lacking Irf5 are protected from pristane-induced lupus in part owing to significant alterations in cytokine expression, including elevated Th2 cytokines and significant weakening of the type I IFN gene signature (19). In support of this, overexpression of IRF5 was reported to induce M1 polarization (proinflammatory) in human macrophages and promote the Th1/Th17 response, whereas knockdown of IRF5 induced the M2 anti-inflammatory phenotype (20). In human SLE, we have shown that IRF5 expression is significantly elevated in primary PBMCs of SLE patients, as compared with healthy donors, and upregulation is specifically associated with the IRF5 SLE risk haplotype in SLE monocytes (21). Subsequently, we demonstrated that IRF5 was constitutively activated (nuclear-localized) in SLE monocytes, and not other immune cell populations examined from SLE patients, further supporting a pathogenic role for IRF5 in SLE monocytes (22). Given that our present findings in human SLE point toward a pathogenic role for IRF5 in SLE monocytes (21, 22), combined with the fact that monocytes are one of the key pathogenic triggers in pristane-induced lupus (6, 7, 23), we sought to use this model to examine further the functional roles of IRF5 in the early stages of disease development that require monocyte trafficking to the peritoneal cavity (PC). We show that mice lacking Irf5 are significantly impaired in their chronic recruitment of Ly6Chi monocytes to the PC owing to intrinsic defects in their chemokine receptor expression. Irf5−/− mice backcrossed eight generations to C57BL/6 mice were obtained from Dr. Ian Rifkin (Boston University School of Medicine) by approval from T. Taniguchi (University of Tokyo, Tokyo, Japan) and T. Mak (University of Toronto, Toronto, ON, Canada) (18). Wild-type (wt) C57BL/6 mice were purchased from The Jackson Laboratory (Bar Harbor, ME). After obtaining the Irf5−/− mice, they were backcrossed two additional times to parental C57BL/6 mice to obtain heterozygotes for intercrossing to obtain a new cohort of Irf5+/+ and Irf5−/− littermates, by standard breeding techniques. Littermate Irf5+/+ mice were used as controls. The dedicator of cytokinesis 2 (Dock2) mutation was analyzed by PCR genotyping of purified RNA from PBMCs of Irf5+/+ and Irf5−/− littermates as described (24). All Irf5+/+ and Irf5−/− littermates used in this study lacked the Dock2 mutation. CD45.1 congenic mice B6.SJL-Ptprca Pepcb/BoyJ were purchased from The Jackson Laboratory. Six- to 8-wk-old mice received a single i.p. injection of 0.5 ml pristane (Sigma-Aldrich, St. Louis, MO), 1.5 ml 4% thioglycollate medium (Sigma-Aldrich), or PBS. Mice were sacrificed at indicated time points after injection. All experimental procedures were approved by the Institutional Animal Care and Use Committee at the University of Medicine and Dentistry of New Jersey, New Jersey Medical School. Cell counting was performed on a Vi-CELL (Beckman Coulter) or FACSCalibur flow cytometer (BD Biosciences) using CountBright absolute counting beads (Invitrogen) according to the manufacturers’ instructions. All Abs were purchased from BioLegend except for anti–CXCR4-PE (clone 2B11; eBioscience) and anti–CCR2-PE (clone 475301; R&D Systems). The monocyte/macrophage population was gated on using anti–CD11b-FITC (clone M1/70) and anti–Ly6G-allophycocyanin (clone 1A8) Abs; monocyte subsets were distinguished from this population using anti–Ly6C-PE/Cy7 (clone HK1.4) Abs. To examine bone marrow chimeric mice, anti–CD45.1-PE (clone A20) and anti–CD45.2-PerCP/Cy5.5 (clone 104) Abs were used. To examine monocyte maturation, anti–I-A-PE (clone M5/114.15.2) and anti–CD86-AF700 (clone GL-1) Abs were used, and anti–IgG2b-PE isotype control (clone RTK4530) Abs were used throughout the study. Surface staining was performed at 4°C for 20 min with an optimized amount of primary Ab or the appropriate isotype control. Intracellular staining was carried out in 0.5% saponin at 4°C for 30 min following surface staining. Samples were acquired on a FACSCalibur or LSR II (BD Biosciences) and data were analyzed with FlowJo (Tree Star) software. Bone marrow cells collected from femurs and tibias were incubated with biotin anti-mouse Ly6G Ab (clone 1A8; BioLegend) followed by incubation with streptavidin microbeads (Miltenyi Biotec). Ly6G+ cells were depleted by magnetic separation with MS columns (Miltenyi Biotec). The negative fraction was incubated with CD11b microbeads (Miltenyi Biotec), and CD11b+ cells were isolated by magnetic separation. Alternatively, monocytes were isolated using an EasySep mouse monocyte enrichment kit (StemCell Technologies). Briefly, bone marrow cells were incubated with Ab mixture against nonmonocytes followed by incubation with biotin selection mixture and magnetic particles. Labeled cells were removed using an EasySep magnet, and monocytes were enriched. The two methods yielded a similar percentage of enriched monocytes per sample. Bone marrow cells were pooled from Irf5+/+ or Irf5−/− littermates and monocytes were isolated using the EasySep monocyte enrichment kit described above. Cells (0.05–0.1 million) were seeded in each of 6.6-mm transwells with 5-μm pores (Corning). Peritoneal lavage fluid or chemokine was added to the bottom well as the chemoattractant, and RPMI 1640 plus 1% BSA medium was used as control. All chemokines were purchased from R&D Systems. Cultures were incubated under 5% CO2 at 37°C for 3 h. Cells that migrated across the insert were trypsinized, collected, and counted on a FACSCalibur (BD Biosciences). A Milliplex Map multiplex mouse cytokine/chemokine kit (Millipore, Billerica, MA) was used to determine chemokine expression level according to the manufacturer’s instructions. Samples were analyzed with a Luminex 100 multianalyte profiling system (Luminex, Austin, TX). Cytokine/chemokine concentrations were determined by standard curves, which were generated using the mixed standard provided with the kit. For the analysis of chemokine receptor transcript expression, bone marrow monocytes were enriched, as described above, and RNA was extracted using the RNeasy Plus Mini kit (Qiagen). Total RNA was converted to cDNA, and a mouse chemokines and receptors quantitative PCR array (SABiosciences) was performed on the ABI 7300 real-time PCR system (Applied Biosystems) using RT2 quantitative PCR master mixes (SABiosciences). Raw data were analyzed with SDS software (Applied Biosystems) and the web-based PCR array data analysis tool (SABiosciences). HEK 293T cells were purchased from the American Type Culture Collection (Manassas, VA) and grown in DMEM (Sigma-Aldrich) supplemented with 10% FBS (Sigma-Aldrich) and 1 IU penicillin per 1 μl/ml streptomycin (Mediatech, Hemdon, VA) at 37°C in a humidified incubator with 5% CO2/95% air. Cells were cotransfected with pGL3b-CCR2 or -CXCR4 promoter reporter plasmids and pCAGEN-mIRF5 or empty vector control plasmid and pRL using Lipofectamine 2000 reagent (Invitrogen) as previously described (14). Luciferase activity was measured 24 h posttransfection and normalized to Renilla activity. Bone marrow cells from CD45.1 Irf5+/+ and CD45.2 Irf5−/− C57BL/6 mice were harvested, treated with RBC lysis buffer (eBioscience), mixed at a 1:1 ratio, and used as donor cells. Recipient Irf5+/+ CD45.2 C57BL/6 mice received 10 Gy irradiation (split dose, 3 h apart) and were i.v. injected with 10 million donor cells 4 h after the second irradiation. Six weeks after transplantation, each mouse was given 0.5 ml pristane i.p. and sacrificed 4 wk later for peritoneal exudate cells (PECs), spleen, blood, and bone marrow. The monocyte/macrophage population was gated on using anti–Cd11b-FITC and anti–Ly6G-allophycocyanin Abs. Splenic macrophages were isolated by positive selection with CD11b magnetic beads. Cells were seeded in a 96-well plate format and preincubated with LPS (100 ng/ml) or medium alone for 35 min (25). Cells were then incubated with 1 mg/ml FITC-dextran for 40 min followed by 1 min incubation with 0.25 mg/ml trypan blue to quench extracellular signal. Phagocytosis was assessed by measuring fluorescein counts at absorbance 485/535 nm. Statistical analysis was done with the two-tailed Student t test or Mann–Whitney U test when variables were not normally distributed. Data are presented as means ± SD (normal distribution) or means ± SEM (non-normal distribution). A p value <0.05 was considered significant. Statistical analyses were performed using Prism 4.0 (GraphPad Software, San Diego, CA). Pristane is a type of hydrocarbon oil that induces SLE in a variety of mouse strains (23). Diseased mice produce autoantibodies against small nuclear ribonucleoproteins and dsDNA and develop immune complex-mediated glomerulonephritis (23). Irf5−/− mice are protected from pristane-induced lupus (19, 26). An early key event in this model is the recruitment of IFN-producing monocytes to the PC following i.p. injection of pristane (6, 7, 23). Type I IFN then stimulates the expression of inflammatory cytokines and chemokines leading to the sustained infiltration of leukocytes and formation of ectopic lymphoid tissues in the PC (6, 7, 27). There are two subsets of monocytes in murine blood: one subset expresses high levels of CX3CR1 and low levels of Ly6C and CCR2, whereas the other subset expresses low levels of CX3CR1 and high levels of Ly6C and CCR2 (28, 29). The Ly6Chi subset is preferentially recruited by pristane and is the major producer of type I IFN in this model (6, 7). In naive C57BL/6 mice, the major components of PECs are CD11b+B220dim B1 cells and CD11bhiLy6G−Ly6C− resident macrophages (7). Upon i.p. injection of pristane, however, CD11b+Ly6G+ neutrophils and CD11b+Ly6G− monocytes are recruited to the PC within 8 h (data not shown) and influx persists for months afterward (30), whereas B1 cells are dramatically reduced in the PC (7). Consistent with previous findings (6, 7), we found that most monocytes elicited by pristane express high levels of Ly6C (Fig. 1A); we also found that there were <2% of B1 cells in the PC after pristane injection (Supplemental Fig. 1). We compared the numbers of peritoneal monocytes in Irf5+/+ (wt) and Irf5−/− littermates before pristane injection and 24 h, 48 h, and 1, 2, 4 and 6 wk after injection. No significant difference was observed at 24 and 48 h postinjection (data not shown). The earliest time point that showed a significant difference in the recruitment of monocytes/macrophages to the PC between littermates was at 2 wk postinjection (Fig. 1B); this difference was even more striking at 4 and 6 wk (Fig. 1C). Similar to total cell numbers in the PC, the frequency of CD11b+Ly6G− monocytes was also reduced in pristane-injected Irf5−/− mice (Supplemental Fig. 2A); the reduction in the Ly6Chi subset is not due to alterations in Ly6C expression between littermates (Supplemental Fig. 2B). A significant decrease in the number of Irf5−/− Ly6Clo cells in the PC was only observed at the later time points. Examination of IRF5 expression in sorted blood cells revealed dramatically higher levels in Ly6Chi monocytes as compared with Ly6Clo monocytes (Supplemental Fig. 3). In contrast to the pristane-induced chronic inflammation model, i.p. injection of thioglycollate induces acute inflammation with recruitment of monocytes/macrophages to the PC; recruitment generally peaks at ∼72 h postinjection and then declines (31). Upon examination of Ly6Chi monocyte recruitment to the PC in response to thioglycollate, we found no significant difference between littermates; notably, the recruitment of Ly6Clo cells was significantly decreased in Irf5−/− mice (Fig. 1D). In either model, the observed defect in monocyte migration to the PC was not due to differences in PC cellular apoptosis (data not shown). These data support a critical role for IRF5 in the recruitment of monocytes to the PC after induction of chronic or acute inflammation. 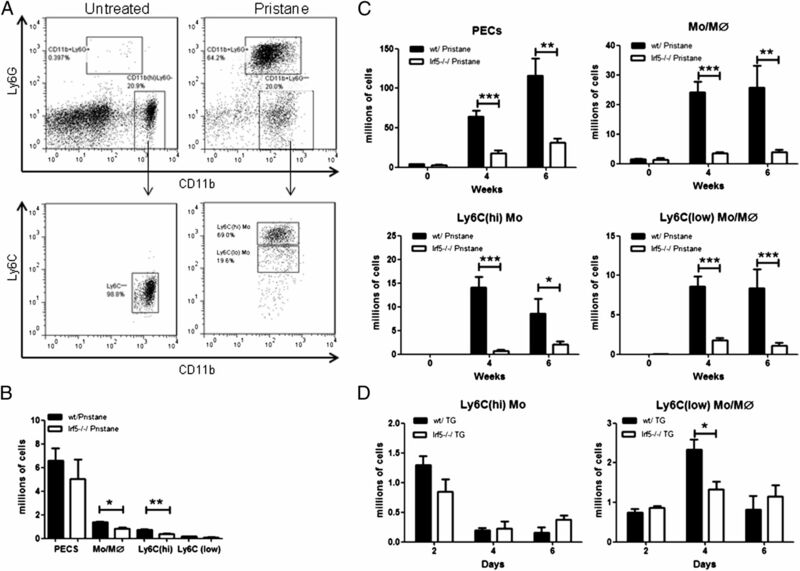 Ly6Chi monocyte recruitment to the PC after pristane-injection is impaired in Irf5−/− mice. Irf5+/+ (wt) and Irf5−/− littermates were i.p. injected with 0.5 ml PBS or pristane and PECs collected by peritoneal lavage with 3 ml PBS. (A) Gating strategy for the analysis of resident macrophages (CD11bhiLy6G−), pristane-elicited monocytes/macrophages (CD11b+Ly6G−) in PECs, and monocyte subsets (Ly6Chi and Ly6Clo) used for subsequent labeling experiments. Representative flow cytometry analysis of resident and pristane-elicited PECs in Irf5+/+ C57BL/6 mice is shown. (B) Flow cytometry quantification of PECs, monocyte/macrophage (Mo/Mϕ), and Ly6Chi and Ly6Clo monocyte subsets at 2 wk after pristane injection. (C) Same as in (B) except quantification was performed at 4 and 6 wk postinjection and cells were counted by Vi-CELL. (D) Flow cytometry quantification of Ly6Chi and Ly6Clo PECs after 1.5 ml i.p. injection of thioglycollate (TG). Results are representative of two independent experiments (n = 4–7 mice/group). *p < 0.05, **p < 0.01, ***p < 0.001 by unpaired Student t test. Impaired Ly6Chi monocyte recruitment to the PC in pristane-injected Irf5−/− mice could be due to an intrinsic defect in Irf5−/− monocytes or an extrinsic defect in the signaling environment of the PC. To test these two possibilities, we performed chemotaxis assays on naive monocytes from Irf5+/+ and Irf5−/− littermates using peritoneal lavage fluid from littermates 4 wk after pristane injection as the chemoattractant. Naive monocytes were enriched from bone marrow cells by magnetic depletion of nonmonocytes; a similar percentage enrichment per sample and number of cells plated per experiment were achieved (Fig. 2A, 2B). Consistent with previous reports, enriched bone marrow monocytes are predominantly Ly6Chi (data not shown) (32, 33). We found that significantly fewer monocytes from Irf5−/− mice, as compared with Irf5+/+ littermates, could migrate toward peritoneal lavage fluid from pristane-injected Irf5+/+ mice (Fig. 2C), supporting an intrinsic defect in Irf5−/− monocytes. Little difference between the migration efficiency of Irf5+/+ and Irf5−/− monocytes to Irf5−/− lavage was observed. Irf5−/− monocytes are defective in their migration toward peritoneal lavage fluid from pristane-injected Irf5+/+ mice. Monocytes were enriched from bone marrow cells of naive Irf5+/+ (wt) and Irf5−/− littermates. (A) Representative flow cytometry analysis of CD11b+Ly6G− monocytes from Irf5+/+ C57BL/6 mice before and after enrichment. (B) Percentages of CD11b+Ly6G− monocytes were assessed by flow cytometry; similar percentages were obtained for each genotype after enrichment. (C) Peritoneal lavage fluid was collected from six littermates per genotype at 4 wk after pristane injection and used as chemoattractant in the chemotaxis assay. The numbers of Irf5+/+ and Irf5−/− monocytes that migrated to bottom wells in response to peritoneal lavage fluid were quantified on flow cytometry using counting beads. Results are representative of three independent experiments (n = 10 mice/group). *p < 0.05 by Mann–Whitney U test. Chemokine receptors are critical for monocyte trafficking under both steady-state and inflammatory conditions (34). CX3CR1 is required for Ly6Clo monocytes to migrate to the periphery to replenish tissue macrophages during homeostasis (35). CCR1, CCR2, CCR5, CCR8, CXCR2, and CXCR4 have been implicated in monocyte recruitment during infection and inflammation; they regulate monocyte egress from bone marrow, migration from the circulation to inflamed tissue, and/or homing to bone marrow (34). The observed decrease in the response of Irf5−/− monocytes to pristane could be due to defects in chemokine receptor expression, resulting in the inability of Irf5−/− monocytes to “sense” inflammatory signals. To test this, we isolated naive monocytes from the bone marrow of Irf5+/+ and Irf5−/− littermates, which are predominantly Ly6Chi, and examined the expression of chemokine receptors using a mouse chemokines and receptors quantitative PCR array (SABiosciences). Receptors that were upregulated or downregulated >2-fold in Irf5−/− monocytes as compared with Irf5+/+ are listed, along with their respective ligands, in Table I. We found a striking decrease in CXCR4 receptor expression on monocytes from Irf5−/− mice, as well as decreases in CXCR3, CCRL1, CCR5, and CCR2, and increases in CCR1 and CX3CR1 expression. To determine whether there is a correlation between chemokine receptor transcript expression and protein expression on Irf5−/− monocytes, we collected blood and bone marrow from naive and pristane-injected Irf5+/+ and Irf5−/− littermates and examined surface or intracellular staining of the chemokine receptors CXCR4, CXCR3, CCR2, and CCR5 on monocyte subsets. No significant difference in the expression of CCR5 or CXCR3 was observed on monocytes from the blood or bone marrow of naive and pristane-injected littermates (data not shown). Instead, a significant decrease in CCR2 expression was found on naive blood monocytes of Irf5−/− mice, as compared with Irf5+/+, and the decrease was observed in both Ly6Chi and Ly6Clo subsets (Fig. 3A, 3B). CCR2 expression is not altered by pristane treatment (7). Because nothing is known of CXCR4 expression in the pristane-induced model of lupus, we examined expression on monocytes from both naive and pristane-injected mice. No defect in CXCR4 expression was observed on naive blood or bone marrow monocytes of Irf5−/− mice (Fig. 3C and data not shown); however, a decrease on bone marrow monocytes of pristane-injected Irf5−/− mice was observed (Fig. 3D–F). Although the mean fluorescence intensity (MFI) of CXCR4 staining was not significantly reduced, the percentage of CXCR4 expressing cells was significantly decreased (Fig. 3D–F). Similar reductions were found on blood monocytes from pristane-injected Irf5−/− mice (data not shown). Decreased expression of CCR2 and CXCR4 on Irf5−/− monocytes. Blood and bone marrow cells were collected from naive and pristane-injected Irf5+/+ (wt) and Irf5−/− littermates. Surface staining was performed with anti-CD11b, -Ly6G, -Ly6C, and -CCR2 Abs, and intracellular staining was performed with anti-CXCR4 Abs; receptor expression was analyzed by flow cytometry. (A) Representative histogram of CCR2 expression on naive blood Ly6Chi monocytes from littermates and (B) quantification of the MFI on Ly6Chi and Ly6Clo monocytes; n = 10–11 mice/genotype. Gray area represents isotype control staining in (A) and (D). (C) Quantification of the MFI of CXCR4 on bone marrow monocytes from naive mice. (D) Same as in (A) except CXCR4 expression was analyzed on bone marrow monocytes 4 wk after pristane injection. (E) Quantification of the MFI of CXCR4 and (F) percentage of CXCR4 expressing cells in Ly6Chi bone marrow monocytes from pristane-injected mice; n = 3 mice/genotype. (G) Irf5−/− monocytes are defective in their response to CCR2 and CXCR4 ligands. Enriched naive bone marrow monocytes from Irf5+/+ and Irf5−/− littermates were seeded inside transwells and medium alone or supplemented with 50 ng/ml CCL2, CXCL12, RANTES, or 300 ng/ml IP10 added to the other side as chemoattractants. Cells that migrated to bottom wells were quantified; n = 6 mice/genotype. Data are representative of two independent experiments. *p < 0.05, **p < 0.01 by Mann–Whitney U test. (H) IRF5 regulates chemokine receptor promoter reporter activity. HEK 293T cells were transiently cotransfected with pGL3b-CCR2 or CXCR4 promoter reporters with pCAGEN-mIRF5 or empty vector and pRL. Luciferase activity was measured and normalized to Renilla activity. Data are presented as relative induction of luciferase activity by IRF5 over control empty vector. Data are representative of three independent experiments performed in duplicate. *p < 0.05, **p < 0.01, ***p < 0.001 by unpaired Student t test. To understand the functional consequence of impaired chemokine receptor expression on Irf5−/− monocytes, we examined the ability of Irf5+/+ and Irf5−/− monocytes to migrate toward specific receptor ligands using the chemotaxis assay. Naive monocytes from either Irf5+/+ or Irf5−/− littermates showed little response to RANTES and IP10 (Fig. 3G); however, a significant defect in the ability of Irf5−/− monocytes to migrate toward the CXCR4 ligand, CXCL12, was found. Additionally, a consistent, yet nonsignificant, reduction in the migration ability of Irf5−/− monocytes toward the CCR2 ligand, CCL2, was observed (Fig. 3G). To begin to address how IRF5 might be regulating the expression of these two genes, we performed promoter reporter assays in HEK 293T cells and found a small yet significant transactivation of both reporters by IRF5 (Fig. 3H). Taken together, these data suggest that the observed defect in both in vivo and in vitro Irf5−/− monocyte recruitment is due to the impaired expression and function of CCR2 and CXCR4 receptors. It has been shown that IRF5 expression promotes M1 polarization and Th1/Th17 cytokine expression while inhibiting M2-associated cytokines (19, 20, 36). Among the cytokines currently known to be regulated by IRF5, such as IFN-α, IL-6, IL-12, and TNF-α, some have been reported to be elevated in the serum of SLE patients (2, 18, 37–39). To this effect, we recently demonstrated that serum levels of the Th1 cytokine IL-6 was decreased, whereas Th2 cytokines IL-4, IL-5 and IL-10 were increased, in pristane-injected Irf5−/− mice (19). Additionally, we showed that CCL2 (MCP-1) expression was significantly reduced in Irf5−/− bone marrow cells (19). Although data in Figs. 1–3 support an intrinsic defect in Irf5−/− monocytes that results in impaired recruitment to the PC, we cannot exclude an extrinsic defect in serum or PC chemokine expression in Irf5−/− mice that may also contribute to impaired recruitment. To further examine this, we measured sera and PC chemokine levels using the Milliplex Map multiplex mouse cytokine/chemokine kit (Millipore) at 2 wk after pristane injection. Interestingly, we found no significant difference in the levels of monocyte-related chemokines (CCL2, IP10, RANTES, MIP1a, and MIP1b) in the peritoneal lavage fluid between Irf5+/+ and Irf5−/− littermates; however, decreases were observed for some of these chemokines in the sera of Irf5−/− mice (Fig. 4). Although a significant defect in IP10 expression was observed in sera from Irf5−/− mice, it is presently not known whether IP10 mediates monocyte recruitment in the pristane model of murine lupus, and neither Irf5+/+ or Irf5−/− monocytes responded to IP10 in vitro (Fig. 3G). Nonetheless, these data provide further support that impaired recruitment of Irf5−/− monocytes to the PC in response to pristane is primarily due to intrinsic defects in chemokine receptor expression and not the chemokines themselves. Expression of monocyte-related chemokines is not impaired in the PC of Irf5−/− mice. Serum and peritoneal lavage fluid (PC) from Irf5+/+ (wt) (n = 2–5) and Irf5−/− (n = 4–6) littermates were harvested at 2 wk after pristane injection. Chemokine levels were determined by beads-based immunoassay. ***p < 0.001 by unpaired Student t test. To unambiguously confirm the intrinsic defect in Irf5−/− monocytes, we generated bone marrow chimeras by injecting 1:1 mixed CD45.1 Irf5+/+ and CD45.2 Irf5−/− bone marrow cells to lethally irradiated CD45.2 Irf5+/+ mice (Fig. 5A). 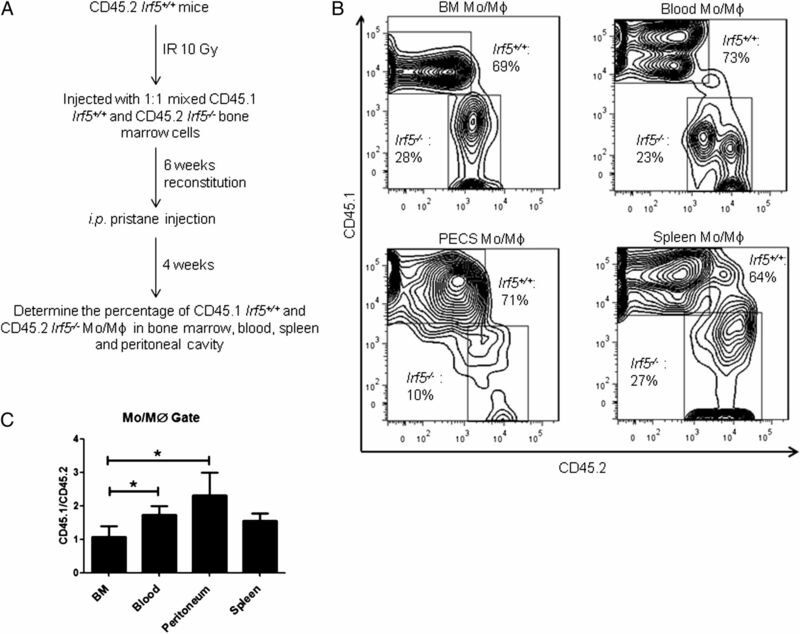 Six weeks after reconstitution, pristane was administered to the reconstituted mice, and 4 wk later, the percentages of CD45.1 and CD45.2 monocytes/macrophages in the bone marrow, blood, PC, and spleen were determined (Fig. 5B). Before injection of pristane, a slight enrichment of Irf5+/+ monocytes was observed in blood and this held true after pristane injection; however, a significant defect in the recruitment of Irf5−/− CD11b+Ly6G− bone marrow cells to the blood and PC of chimeras was observed, as the ratio of Irf5+/+ (CD45.1) to Irf5−/− (CD45.2) monocytes went up from ∼1 in bone marrow to ∼1.8 in the blood and ∼2.2 in the PC (Fig. 5C). Fewer than 5% of CD11b+Ly6G− cells from chimeras were CD11b+B220dim B1 cells (data not shown). These data support the impaired recruitment of Irf5−/− monocytes to the PC in response to pristane owing to an intrinsic defect in Irf5−/− monocytes. Impaired recruitment of Irf5−/− monocytes to the PC of pristane-injected bone marrow chimeras. (A) Schematic of bone marrow reconstitution model. (B) Representative contour plots showing percentages of CD45.1 Irf5+/+ and CD45.2 Irf5−/− cells in the monocytes/macrophages (Mo/Mϕ) gate in different compartments. (C) Ratio of CD45.1 and CD45.2 Mo/Mϕ in the bone marrow (BM), blood, PC (PECs), and spleen of chimerical mice. Results are representative of two independent experiments (n = 10 mice). *p < 0.05 by paired Student t test. In human SLE, impaired cell clearance and accumulation of apoptotic debris is thought to contribute to a break in self-tolerance, leading to the production of pathogenic autoantibodies (40). Indeed, cells from SLE patients appear more susceptible to apoptosis than do those from healthy donors, yet their macrophages are impaired in their ability to engulf apoptotic material (41, 42). In the pristane-induced model of murine lupus, it was found that the rapid turnover of recruited monocytes in the PC of pristane-injected wt mice was associated with a lack of differentiation into more phagocytic Ly6Clo monocytes/macrophages (7), which was consistent with previous observations that the uptake of carbon particles is substantially reduced after pristane injection (43). Furthermore, pristane induces apoptosis both in vivo and in vitro and is thought to be one of the critical first events in the pathogenesis of pristane-induced lupus that is similar to human SLE (44). First, we examined whether loss of Irf5 alters monocyte/macrophage differentiation. At 4 wk after pristane injection, we examined activation/maturation markers I-A (MHC class II) and CD86 on PC monocytes from Irf5+/+ and Irf5−/− littermates and found no significant difference in expression (Fig. 6A). We next examined in vitro phagocytosis and found that macrophages from Irf5−/− mice had enhanced phagocytic ability in their response to LPS as compared with macrophages from Irf5+/+ littermates (Fig. 6B). These data support a potentially new role for IRF5 in phagocytosis that is not due to alterations in the activation/maturation of monocytes. CD11b+ splenic macrophages from Irf5−/− mice display enhanced phagocytosis. (A) PECs were collected from Irf5+/+ (wt) and Irf5−/− littermates 4 wk after pristane injection. Expression of activation/maturation surface markers I-A (MHC class II) and CD86 were examined on CD11b+Ly6G− monocytes; n = 5 mice/genotype. (B) Splenic macrophages from Irf5+/+ and Irf5−/− mice were isolated by positive selection and in vitro phagocytosis determined by measuring fluorescein counts. n = 4–5/genotype. **p < 0.01 by unpaired Student t test. The recruitment of monocytes to inflamed tissues is critical for host defense against a variety of pathogens; however, this response can be a double-edged sword creating a state of chronic inflammation if not properly regulated (34). Monocyte trafficking is directed by adhesion proteins, chemokines, and their receptors (34), but the mechanisms and factors controlling these molecules have yet to be fully elucidated. Others and we have recently demonstrated in the pristane-induced model of chronic inflammation, which results in the development of lupus-like disease, that mice lacking the transcription factor Irf5 are protected from disease development (19, 26, 36). We found that protection of Irf5−/− mice from lupus onset and pathogenic autoantibody production was due in part to a weakened type I IFN signature and significant skewing of the cytokine milieu toward a more protective Th2-like environment (19). In the present study, we examined the role of IRF5 in the early stages of lupus development that require monocyte trafficking to the PC in response to i.p. injection of pristane. We found a significant reduction in the migration of Ly6Chi monocytes to the PC as early as 2 wk postinjection (Fig. 1). These data are reminiscent of findings from pristane-injected IFNAR−/− mice except that we did not observe a concomitant increase in Ly6Clo monocytes/macrophages in the PC (7); TLR7−/− and MyD88−/− mice also gave similar decreases in Ly6Chi monocyte recruitment to the PC, but the Ly6Clo subset was not analyzed (45). While preparing this manuscript, a paper by Xu et al. (36) was published that reported the similar finding of reduced Ly6Chi monocyte recruitment to the PC of pristane-injected Irf5−/− mice; however, identical to the pristane-injected IFNAR−/− mice, they observed a significant increase in the percentage of Ly6Clo cells in the PC at 2 wk postinjection. The difference between our findings may in part be explained by the complete abolishment of the type I IFN gene signature in their pristane-injected Irf5−/− mice (36), whereas we only observed a significant weakening of the IFN signal (19). It was found that accumulation of the Ly6Clo subset in the PC of IFNAR−/− mice was due to enhanced maturation of Ly6Chi monocytes to Ly6Clo rather than the preferential recruitment of the Ly6Clo subset (7). We did not observe a significant difference in the expression of activation/maturation markers I-A and CD86 on peritoneal monocytes between Irf5+/+ and Irf5−/− littermates, supporting the observed lack of increase in the Ly6Clo subset (Fig. 6) (46). It was recently reported that several independent colonies of Irf5−/− mice in the United States are contaminated with a spontaneous genomic duplication and frameshift mutation in the guanine exchange factor Dock2 gene (24). Dock2, an atypical Rac activator, is essential for TLR7/9-mediated IFN-α induction in PDCs, T and B lymphocyte migration, atrophy of lymphoid follicles, and loss of marginal zone B cells (46–48). Previously observed phenotypes of the Irf5−/− mice, such as altered marginal zone B cells, changes in PDC number and function, and type I IFN responses, are now being put into question by these findings (24). It was not reported by Xu and colleagues (36) whether their Irf5−/− mice were screened for the Dock2 mutation that could potentially contribute to the complete abolishment of the type I IFN signature. We have reported the genotype of our Irf5−/− mice and they contain homozygous wt Dock2 alleles (19). For the most part, results from three independent studies on pristane-injected Irf5−/− mice have been quite similar (19, 26, 36). Nonetheless, it will be critical to our understanding of IRF5 function to replicate and confirm previous findings in Irf5−/− mice that have been genotyped for the Dock2 mutation. The mechanisms of impaired Ly6Chi monocyte recruitment to the PC of pristane-injected Irf5−/− mice were not examined in the recent study by Xu and colleagues (36). In this study, we found the defect in Ly6Chi monocyte recruitment to the PC of Irf5−/− mice to be due, at least in part, to decreased expression of chemokine receptors CCR2 and CXCR4 on Ly6Chi monocytes of Irf5−/− mice (Fig. 3). Previous studies have shown that CCR2 is required for monocyte egress from the bone marrow to the circulation during homeostasis and inflammation (49–51). More importantly, it has been shown that the chronic influx of monocytes to the PC by pristane is dependent on CCR2, as both Ly6Chi and Ly6Clo monocyte subsets were largely absent in the PC of Ccr2−/− mice (7). We observed normal egress of Ly6Chi monocytes from the bone marrow of Irf5−/− mice to the circulation, and CCR2 protein expression on Irf5−/− bone marrow monocytes was not changed between Irf5+/+ and Irf5−/− mice (data not shown); however, CCR2 expression was significantly reduced on circulating Irf5−/− blood monocytes (Fig. 3). Although little is known of CXCR4 expression and function in the pristane-induced model of murine lupus, expression of CXCR4 has been shown to be upregulated on Ly6Chi monocytes of lupus-prone murine strains, and accumulation of CXCR4-expressing monocytes/macrophages has been observed in the kidneys of diseased mice (52). CXCR4 antagonism has also been shown to restore monocyte numbers in the circulation following monocyte depletion by CCL2-blocking molecules, and administration of CXCR4 antagonists protects B6.Sle1.Yaa mice from lupus (53). Similar to findings of CCR2 expression (7), CXCR4 expression on monocytes was not increased after pristane injection (data not shown); however, CXCR4 protein levels were significantly reduced on bone marrow (Fig. 3F) and blood (data not shown) monocytes from pristane-injected Irf5−/− as compared with Irf5+/+ mice. To put these findings into perspective with the Dock2 mutation, although homing of lymphocytes to secondary lymphoid tissues has been shown to be defective in Dock2−/− mice, the numbers of monocytes in the periphery of Dock2−/− mice were maintained and Dock2−/− monocytes responded normally in vitro to CCL2 and CXCL12 ligands (47). Data in Fig. 3G support that the observed intrinsic defects in CCR2 and CXCR4 expression on Irf5−/− Ly6Chi monocytes and their inability to respond to CCL2 and CXCL12 are not due to confounding genotype results, as present data support that Dock2 is dispensable for monocyte trafficking (47). These data are further enhanced by the fact that IRF5 can regulate the CCR2 and CXCR4 promoters (Fig. 3H). Thus, these data instead point toward a critical role for IRF5 in regulating the molecules, that is, chemokine receptors, which are important for pristane-induced monocyte trafficking to the PC. In vivo data from Irf5−/− mice (Fig. 1) and bone marrow chimerical mice (Fig. 5C) provide clear support for the intrinsic defect in Irf5−/− monocytes. In response to pristane, data from both of these models reveal a defect in the recruitment of Irf5−/− monocytes to the PC; however, data from bone marrow chimerical mice suggest that the primary defect may be in the initial response of Irf5−/− bone marrow monocytes to signals in the blood environment because a significant decrease in the recruitment of Irf5−/− monocytes from the bone marrow to the blood was observed (Fig. 5C). Results from the in vitro chemotaxis assay also support a defect in the response of Irf5−/− bone marrow monocytes to peritoneal lavage fluid from pristane-injected Irf5+/+. Somewhat surprising, however, was the finding of no significant difference between the recruitment of Irf5+/+ and Irf5−/− bone marrow monocytes to peritoneal lavage from Irf5−/− mice (Fig. 2C). This small discrepancy is likely a result of in vivo versus in vitro experimentation and the different signals monocytes are exposed to in each compartment (bone marrow, blood, or PC). The in vitro chemotaxis assay simply measured the response of bone marrow monocytes to signals from peritoneal lavage fluid; unlike the in vivo systems, it did not take into account signals from the blood that the bone marrow monocytes would first be exposed to before recruitment to the PC. Another possible explanation is that bone marrow monocytes and blood monocytes lacking Irf5 respond differently to signals from the PC. Further studies will be required to clearly define the role of IRF5 in these two cell populations. In conclusion, this study defines an essential role for IRF5 in the recruitment of monocytes to the PC in the pristane-induced model of chronic inflammation and murine lupus. Given the recent finding that IRF5 is already activated (nuclear-localized) in human SLE monocytes (22), supporting a pathological function for IRF5 in human disease, it will be interesting to expand these types of studies to examine the functional role of IRF5 in monocytes/macrophages from SLE patients. Taken together, these findings clearly demonstrate an intrinsic role for IRF5 in the regulation of inflammatory monocyte migration through its ability to control chemotactic responses to CCL2 and CXCL12 and provide significant new insight into how the dysregulation of IRF5 expression and activation may contribute to human SLE pathogenesis. We thank Ian Rifkin for providing the Irf5-deficient mice by approval from Tadatsugu Tanaguchi and Tak Mak. This work was supported in part by funds from the University of Medicine and Dentistry of New Jersey/New Jersey Medical School, by National Institutes of Health/National Institute of Arthritis and Musculoskeletal and Skin Diseases Grant 5R03AR054070, and by the Arthritis Foundation (to B.J.B.).
. 2010. The pathophysiologic role of monocytes and macrophages in systemic lupus erythematosus: a reappraisal. Semin. Arthritis Rheum. 39: 491–503.
. 2006. Is disturbed clearance of apoptotic keratinocytes responsible for UVB-induced inflammatory skin lesions in systemic lupus erythematosus? Arthritis Res. Ther. 8: R156.
. 2008. A novel type I IFN-producing cell subset in murine lupus. J. Immunol. 180: 5101–5108.
. 2009. 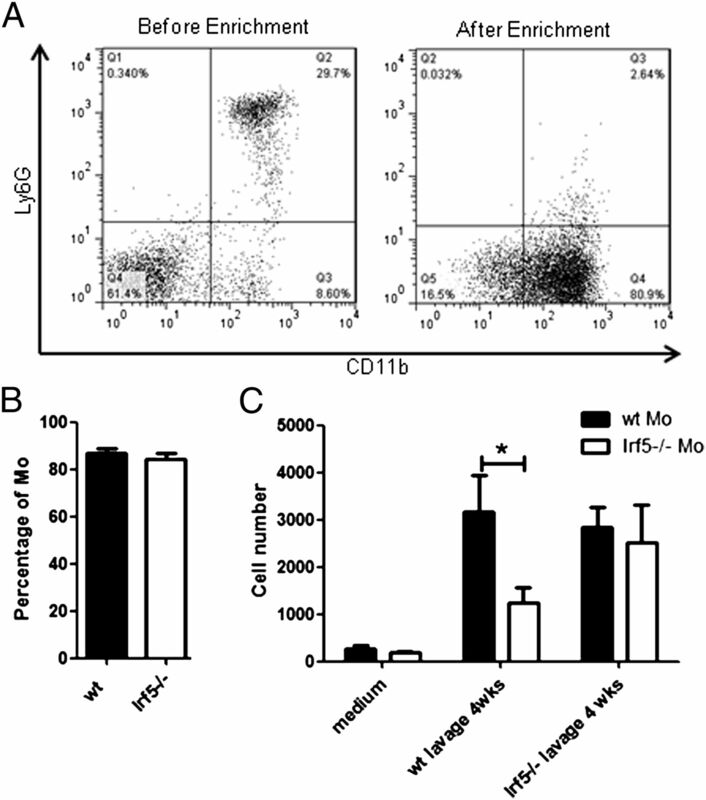 Type I interferon modulates monocyte recruitment and maturation in chronic inflammation. Am. J. Pathol. 175: 2023–2033.
. 2007. Association of IRF5 in UK SLE families identifies a variant involved in polyadenylation. Hum. Mol. Genet. 16: 579–591.
. 2007. Association of a common interferon regulatory factor 5 (IRF5) variant with increased risk of systemic lupus erythematosus (SLE). Ann. Hum. Genet. 71: 308–311.
. 2007. Structural insertion/deletion variation in IRF5 is associated with a risk haplotype and defines the precise IRF5 isoforms expressed in systemic lupus erythematosus. Arthritis Rheum. 56: 1234–1241.
. 2007. Replication of the genetic effects of IFN regulatory factor 5 (IRF5) on systemic lupus erythematosus in a Korean population. Arthritis Res. Ther. 9: R32.
. 2005. Polymorphisms in the tyrosine kinase 2 and interferon regulatory factor 5 genes are associated with systemic lupus erythematosus. Am. J. Hum. Genet. 76: 528–537.
. 2012. Irf5-deficient mice are protected from pristane-induced lupus via increased Th2 cytokines and altered IgG class switching. Eur. J. Immunol. 42: 1477–1487.
. 2011. IRF5 promotes inflammatory macrophage polarization and TH1-TH17 responses. Nat. Immunol. 12: 231–238.
. 2012. 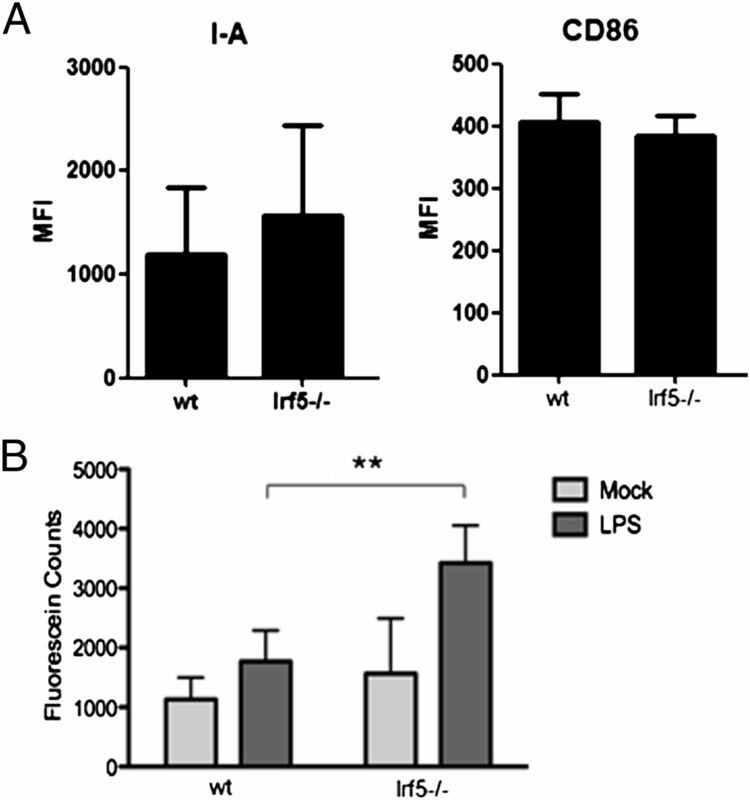 Interferon regulatory factor 5 activation in monocytes of systemic lupus erythematosus patients is triggered by circulating autoantigens independent of type I interferons. Arthritis Rheum. 64: 788–798.
. 2009. Induction of autoimmunity by pristane and other naturally occurring hydrocarbons. Trends Immunol. 30: 455–464.
. 2010. Contribution of IRF5 in B cells to the development of murine SLE-like disease through its transcriptional control of the IgG2a locus. Proc. Natl. Acad. Sci. USA 107: 10154–10159.
. 2006. Type I interferon production by tertiary lymphoid tissue developing in response to 2,6,10,14-tetramethyl-pentadecane (pristane). Am. J. Pathol. 168: 1227–1240.
. 2001. Inflammatory chemokine transport and presentation in HEV: a remote control mechanism for monocyte recruitment to lymph nodes in inflamed tissues. J. Exp. Med. 194: 1361–1373.
. 1976. The requirement of an adherent cell substratum for the growth of developing plasmacytoma cells in vivo. J. Exp. Med. 144: 1554–1567.
. 1998. Plasminogen deficiency differentially affects recruitment of inflammatory cell populations in mice. Blood 91: 2005–2009.
. 2003. Developmental stages of myeloid dendritic cells in mouse bone marrow. Int. Immunol. 15: 515–524.
. 1994. Distinct mouse bone marrow macrophage precursors identified by differential expression of ER-MP12 and ER-MP20 antigens. Eur. J. Immunol. 24: 2279–2284.
. 2012. Pleiotropic IFN-dependent and -independent effects of IRF5 on the pathogenesis of experimental lupus. J. Immunol. 188: 4113–4121.
. 2006. Proinflammatory cytokines (TNF-α and IL-6) in Egyptian patients with SLE: its correlation with disease activity. Cytokine 35: 148–153.
. 1999. Estimation of SLE activity based on the serum level of chosen cytokines and superoxide radical generation. Mediators Inflamm. 8: 93–100.
. 1999. Levels of IL-12 in the sera of patients with systemic lupus erythematosus (SLE): relation to Th1- and Th2-derived cytokines. Clin. Exp. Immunol. 116: 169–173.
. 2010. Monocyte and macrophage abnormalities in systemic lupus erythematosus. Arch. Immunol. Ther. Exp. (Warsz.) 58: 355–364.
. 2003. Increased apoptotic neutrophils and macrophages and impaired macrophage phagocytic clearance of apoptotic neutrophils in systemic lupus erythematosus. Arthritis Rheum. 48: 2888–2897.
. 1994. Pristane retards clearance of particulate materials from the peritoneal cavity of laboratory mice. J. Immunol. Methods 173: 273–278.
. 2005. Induction of apoptosis by the hydrocarbon oil pristane: implications for pristane-induced lupus. J. Immunol. 175: 4777–4782.
. 2008. TLR7-dependent and FcγR-independent production of type I interferon in experimental mouse lupus. J. Exp. Med. 205: 2995–3006.
. 2010. Selective control of type I IFN induction by the Rac activator DOCK2 during TLR-mediated plasmacytoid dendritic cell activation. J. Exp. Med. 207: 721–730.
. 2011. The inflammasome adaptor ASC regulates the function of adaptive immune cells by controlling Dock2-mediated Rac activation and actin polymerization. Nat. Immunol. 12: 1010–1016.
. 2010. Monocyte trafficking to hepatic sites of bacterial infection is chemokine independent and directed by focal intercellular adhesion molecule-1 expression. J. Immunol. 184: 6266–6274.
. 2009. CCR2 and CXCR4 regulate peripheral blood monocyte pharmacodynamics and link to efficacy in experimental autoimmune encephalomyelitis. J. Inflamm. (Lond.) 6: 32.